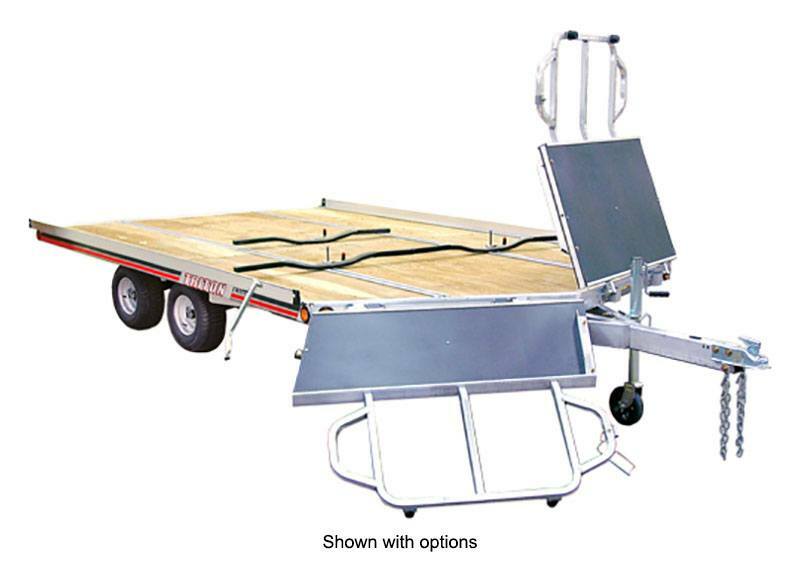 Triton’s open snowmobile trailers are designed for hauling one to four sleds. Choose from ramp or tilt bed models to suit your loading and unloading preference, and add accessories to customize and protect machines from salt and road debris. Take a look at some additional features below, and be sure to request a quote from your dealer when you find the model you’re looking for. FULLY WELDED FRAM: The Triton difference – all-aluminum, fully welded box frame with no C-channels provides a solid structure for years of loading and unloading. DURABLE DECK: Fully treated 5/8" marine grade plywood deck stands up to the elements for years of outdoor use. SUR-LOCK TIE DOWNS: Steel tie down bars have a vinyl-dip finish and stainless steel handles to easily secure snowmobile skis. Tie down bars have boot at each end to protect skis. With Brakes - 4,000 lb. Without Brakes - 1,995 lb. With Brakes - 5,000 lb.